There's a saying I've heard from photographers that goes, the best camera is the one you have with you. The idea is that you can have the fanciest camera kit in the world, but if it's so cumbersome that you never end up carrying it around, it'll do you less good than the camera built into the cellphone that's actually in your pocket. That idea reminds me of how I feel about vegetable slicers. At home, I own three. I have a full-fledged professional mandoline; I also own a Japanese Benriner slicer that I've had since my restaurant-cooking days; and then a cheapo ceramic slicer that I didn't buy and can't recall how I got, but remember thinking I'd never actually use given the two other slicers in my collection. What's funny is that whenever I now need thin, even slices of something, I find myself always reaching for the cheap ceramic one. Now that I think about it, I'm not sure I've used my professional mandoline in more than a decade and can't really say when I last used the Benriner either. It's just like the camera: even though I own pro-level stuff, it often feels like too much of a hassle to get that gear out and set it up. Instead, I grab the much less impressive tool, because it requires no setup and very little cleanup. And frankly, for most of the tasks I need a slicer for at home, it does just fine. That got me wondering if there are other even more worthy mandolines and slicers out there on the cheaper end of the spectrum, so I ordered every mandoline-style slicer sold through Amazon for $50 or less* and put them to the test. *I also grabbed one that came in just slightly higher at $52. What's a Slicer Good for? Vegetable slicers get pretty heavy use in restaurant kitchens, where they're helpful for very quickly creating uniform slices, such as vegetables for salads, potatoes for chips, as well as some specialty cuts like gaufrettes (waffle-cut chips), and sticks for things like French fries. The ability to make cuts of a totally consistent thickness (and impressive thinness) is particularly helpful in a restaurant setting where diners pay top dollar for picture-perfect plating. In the case of hot dishes, such carbon-copy cuts also help ensure even cooking. That's particularly important with something like a potato chip, where inconsistencies of thickness would lead to a batch of chips that are half undercooked and half burnt to a crisp. At home, there's generally less of a need for such precision, though it still comes in handy at times. I mostly use mine to rapidly make thin slices of vegetables like radishes for a salad or potatoes for a gratin, though if I ever had the inclination to make potato chips or fries from scratch (a rare event), a slicer would be essential. Given the lesser importance of a slicer in a home kitchen, it makes sense to look for ones on the cheaper end of the price spectrum—the models that are on the market now are more than good enough for just about any task you'd likely need one for. To test out the slicers, I cut multiple types of fruits and vegetables, from very firm ones like potatoes and parsnips down to difficult-to-slice soft ones like tomatoes and lemons, making sure to test each slicer at all of its thickness settings. For those slicers that include attachments for making cuts beyond simple slicing, such as batonettes (sticks such as French fries), julienne (matchsticks), and crinkle-cuts (for ruffled potato chips or waffle fries), I also tested those. Aside from pure cutting ability and mechanical function, my results also take into account personal preferences: I penalized slicers with lots of loose parts, or that require cumbersome changing of pieces for what should be simple adjustments of slice thickness (it's surprising how many have designs that necessitate swapping out big pieces of plastic just to go from a thin to thick setting). In my experience, inefficient designs like that make it too easy to lose critical pieces over time and are frustrating to work with. A good slicer, in my book, should allow for easy and rapid adjustment of thickness settings, and have as few loose parts as possible. I also tested the safety guards that come with each device. Most restaurant cooks quickly learn to use a slicer without the safety guard, often because the guards are poorly designed and make slicing more difficult, but it's a dangerous decision to make and not one I recommend. It didn't take me long to narrow the list of nine down to my top three slicers. Many of the ones I tested had fundamental problems, including thickness settings that shifted while I was using the slicer, runways that kicked up during slicing (dangerously tripping my hand on the backstroke), drastic unevenness during slicing (uneven slicing can happen on all the slicers I tested, but some created slices that were laughably uneven), and overall flimsy build. One model, ranked highly by both Cook's Illustrated and the Sweet Home failed our tests because its runway shifted during use (it is designed with a lock button that is supposed to prevent this, but minimal pressure on the runway overrode the lock). The following three slicers were the last ones standing after all of my tests. They aren't perfect, but I'd be happy with any of them in my kitchen. All three of these slicers have safety settings that keep the blade locked in a recessed position during storage, reducing the chances of accidentally cutting yourself on them when not in use. This slicer from OXO has four thickness settings (plus a locked storage setting for safety), which can be quickly set with the turn of a dial on the side of the slicer. Each setting is clearly marked in both millimeters and inches—1/16" (1.5mm), 1/8" (3mm), 3/16" (4mm), and 1/4" (5mm)—making it easy to instantly know the thickness of the slice you're going to get. 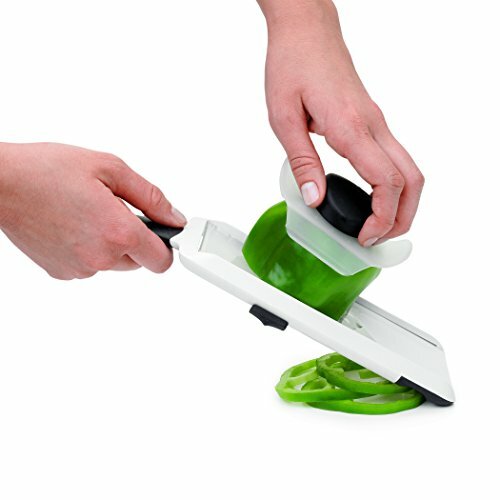 A fold-down stand allows this slicer to either be set on a cutting board (with the legs down) or perched over a bowl (with the legs up). The safety grip worked well, with metal prongs that securely gripped the food without fail. The blade itself is a V-blade design, which allows for a steeper angle of attack, increasing the blade's efficiency and cutting ability. The down side is V-blades can't be sharpened, though Oxo sells replacement blades for this device so dull ones can be swapped out for sharp new ones if needed. One common problem with vegetable slicers is uneven thickness of the slices, though the issue largely has to do with uneven pressure applied by the user during the stroke. This slicer was able to produce fairly even slices, but in the photo above you can see that I had trouble getting a good slice of the lemon on the thinnest setting (then again, I can't really think of a situation in which I'd need such a thin lemon slice). Overall, I found this slicer easy to use, with a sharp blade that offered minimal resistance, and slices that were mostly quite even. 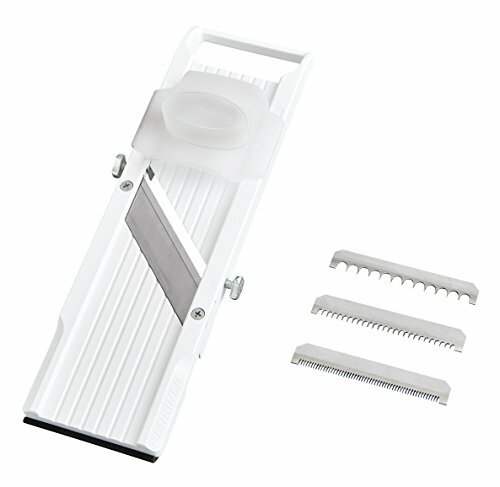 One of the things I liked best about this slicer was its completely self-contained design: it comes with two attachments for battonette and julienne cuts and a corrugated blade for crinkle cuts, all of them securely and compactly stored on the underside of the slicer's runway. Simply pop the runway up for easy access. The slicer made very good, clean cuts with those attachment blades, such as the French-fry potato sticks you see here. My only issue with the attachment-blade design is that you have to put your fingers dangerously close to the sharp teeth to pop the blade back out, which requires some force. Slipping while doing this could lead to a nasty injury, so it's probably best to protect your hands with a dry kitchen towel. If you're looking for an inexpensive slicer that can do a variety of cuts, including crinkle, battonettes and julienne, this is my top choice. Handheld slicers like this one have a lot less firepower than more fully-equipped ones like Oxo's model above, but their compact size and ease of use make them very attractive for basic slicing tasks. Honestly, for most of my slicing needs at home, one of these is more than sufficient (hence why I haven't used my fancier ones in such a long time). I liked this model from OXO the best, thanks to its super sharp blade and incredibly easy-to-adjust thickness settings, controlled by a slider on the side of the slicer. It has three thickness settings, though I can't find any official information from Oxo on the exact thickness of each slice. Based on my own measurements, they're about 1/16", 1/8", and 1/4". The blade isn't replaceable, so once it dulls you'd have to buy a new slicer (at under $15, that's not such a big deal). As you can see in the photos above and below, there is slight unevenness on the thinnest slices, which as I mentioned above is a common issue with slicers that has just as much to do with uneven pressure applied by the user as it does the slicer design. The lemons proved difficult on the thinnest setting, just as they were on the other Oxo slicer, though I should note that I was able to get perfectly even and whole slices of lime on this same slicer at that setting. And just as I mentioned above, it's such a paper-thin setting that I'm not even sure what cooking application would require it. The safety guard on this hand-slicer is less robust than the one that comes with the larger Oxo model, with none of the metal pins to hold the vegetable in place. Instead, it has small pointed plastic nubs that grip the food, and a rubber-coated handle for a better grip. While it isn't as secure as the other type, I still found this guard to work very well, with no issues of food slipping or rolling out from under my hand. I also liked the ergonomics of this handheld slicer, finding it comfortable to hold, though of course that may not be true of every hand size. For those who don't want to have to hold the slicer in their hands all the time, it's worth noting that notched rubber sections on the bottom side of this slicer make it possible to set it on a bowl with less risk of it sliding off. In my tests, I found this slicer not to have an issue of the runway kicking up, which was a problem of some of the other handheld models I tried. Still, my colleague Niki, who has this slicer at home, told me she sometimes does have that problem with it, so while I didn't see signs of that as an issue during my slicing tests, it's something that can happen. If you think you'll need to cut battonettes, waffle-fries, or other specialty cuts, this slicer won't suffice. But if, like me, you'll mostly use it to rapidly make thin slices of things, this slicer's compact size, good ergonomic design, sharp blade, ease of use, functional safety guard, and low price (under $15 at the time of writing) make it a good choice. I'll be honest that I was expecting to like the Benriner a lot more than I did. I've used one for years and years, mostly in a professional setting, and it's always performed very well for me. But when tested it next to other slicers on the market, there were several things that left me wanting. Still, the Benriner has one thing going for it that has convinced me to give it a recommendation despite those reservations: it's the only slicer I found in this price range that allows for any slice thickness up to 1/4 inch. 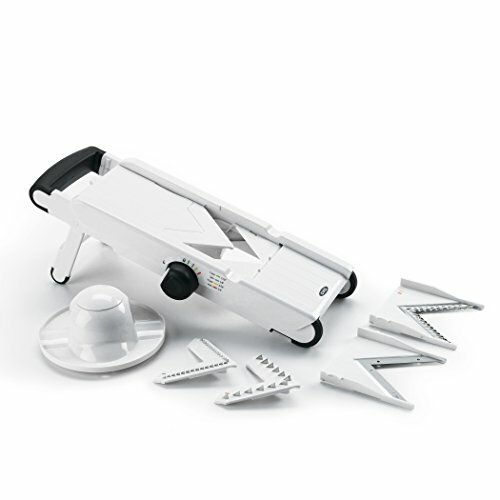 Using a screw to adjust the gap between the runway and blade, the Benriner gives you the most control over the exact thickness of each slice. If you're not content settling for discrete thickness settings, the Benriner is the only choice I found in this price range that will work. It's worth noting, though, that the Benriner has no measurement markings on it, meaning that while you can set it to any thickness you want, there's no easy way to know exactly what thickness you've chosen unless you break out a ruler to double check. In a lot of cases, there's not really a need for such an extreme level of precision, though if a recipe does call for a specific thickness (say for French fries), it'd be helpful if the slicer itself could let you know if you've got it right or not. The Benriner has long been the slicer you'd be most likely to find in a chef's knife bag—prized because it's sturdy, compact and, in theory, sharp. I was surprised, though, to find the blade on the brand new one I ordered to be less sharp than the other slicers on this list. It's still sharp enough to cut most of the food I tested without too much trouble, but I could feel the resistance in a way I didn't with the others. On the positive side, this is one of the few slicers with a blade that can be removed and sharpened, so it's possible to get it even sharper if you know your way around a whetstone, or are willing to take it to a good professional sharpener. The model pictured here is the thinner of Benriner's two models, and is thin enough that some wider foods, like very large potatoes, may not fit. Benriner does, however, sell a wider slicer as well that is otherwise exactly like this one. As any chef can tell you, the safety guard that comes with the Benriner is as good as useless; it simply doesn't work. Foods snag, trip, and get pulled out from under the guard constantly. Given how well the guards worked on so many of the other slicers I tested, this really seems like something Benriner could fix. If you're going to use a Benriner, the trick is to protect your hand another way, such as with a clean folded kitchen towel. It's not ideal, but it usually works, though of course there's more risk that you'll hurt yourself this way. The Benriner comes with a set of three cross-cutting blades for making fries, julienne, and other strips. I've never had any luck getting good cuts with these, both with my own Benriner that I've used for years, and also with the new one I used in these tests. The photos can't really show it, but the potato I'm attempting to cut here is completely stuck on the teeth, refusing to move. In the photo above, you can see that I only got about half an inch deep before it stopped and refused to go any farther. Using way more force than is safe, I finally managed to push it all the way through. But the resulting strips were ragged and uneven, as you can see below. Most pros get around this by slicing the potato or other vegetable to the desired thickness, and then using a knife to cut those slices down further into sticks or julienne. In short, if you want the ability to cut to any thickness, get the Benriner. Otherwise, you'd be better off with one of the other two here.